It's often said that the great diversity of small craft is a result of the extremely various uses required of boats and the extremely various environments in which they are used (along with differences in access to raw materials). I think this misses one important factor: the individuality of humanity. 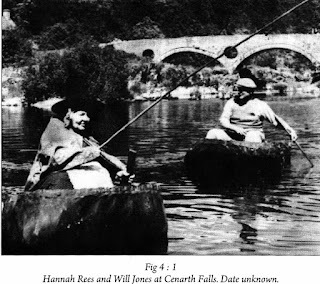 In Coracles of the World, Peter Badges describes how each of the numerous types of coracle in the British Isles are native to an individual river, or even a stretch on a river, with a different type sometimes being used upstream or downstream. But surely, some of these stretches of river have very nearly the same conditions, be they in Scotland, England, Wales or Ireland, and many locales have access to the same or similar materials. 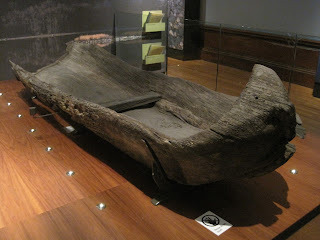 The uses to which coracles were traditionally put were also pretty consistent and of limited diversity: viz, mainly fishing with nets; angling; and the transportation of humans and cargo. This isn't to imply that angling and net-handling impose the same design requirements. 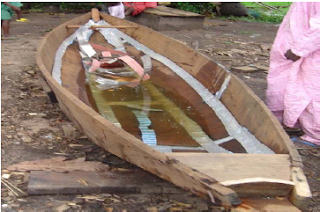 But boats that are used in similar ways on similar rivers would function equally well if they were of similar designs. 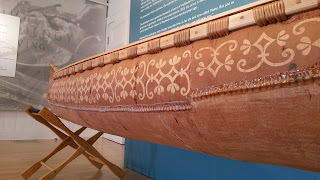 I think it probable that much of the diversity in boat design is due to the impulse of individualism in so many craftsman. This impulse is often a creative or innovative one -- a desire to attempt some improvement in functionality, appearance, or ease of construction. Sometimes, though, it is probably due to a simple desire to do things differently from one's parent, employer, or neighbor; to be able to say "This is my idea/my design." 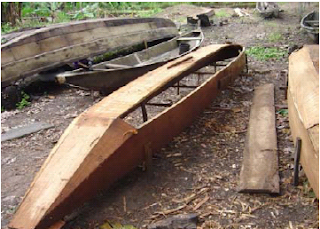 Even if the attempt at a functional improvement does not actually produce one -- even if the change just to be different makes the boat more difficult to construct or use -- the builder might continue building his boats in that manner, simply because it is his own way. And if he has a son or an apprentice or half-a-dozen customers who get accustomed to his boats, the new style might become entrenched in a small, parochial geographic zone, which the British Isles have in such abundance. 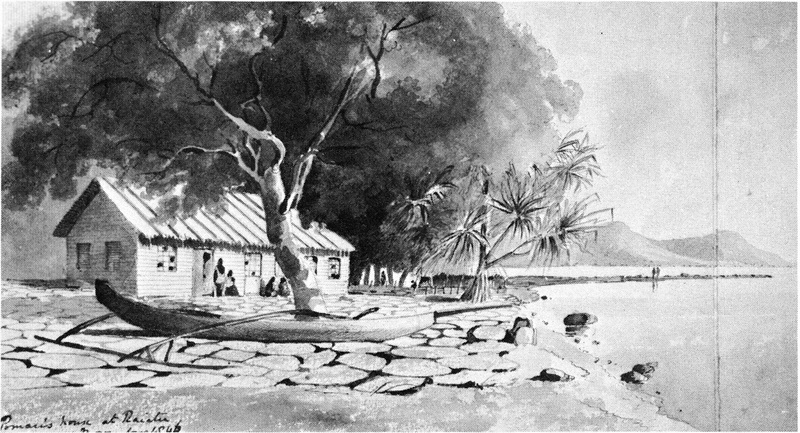 Before the days of radio and television, there were those who claimed to be able to identify the home of any Britisher to within 40 miles or so based strictly upon his speech. (I think Henry Higgins claimed as much.) No one would argue that a Cornwall dialect is objectively superior to a Fife one. (Okay, they probably do. But the argument won't hold up in court.) 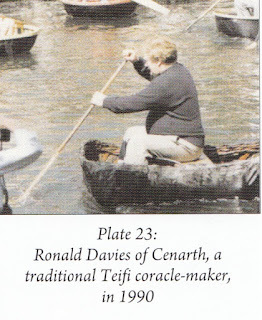 Coracles I think, are like that: some of the differences are simply differences, not advantages. 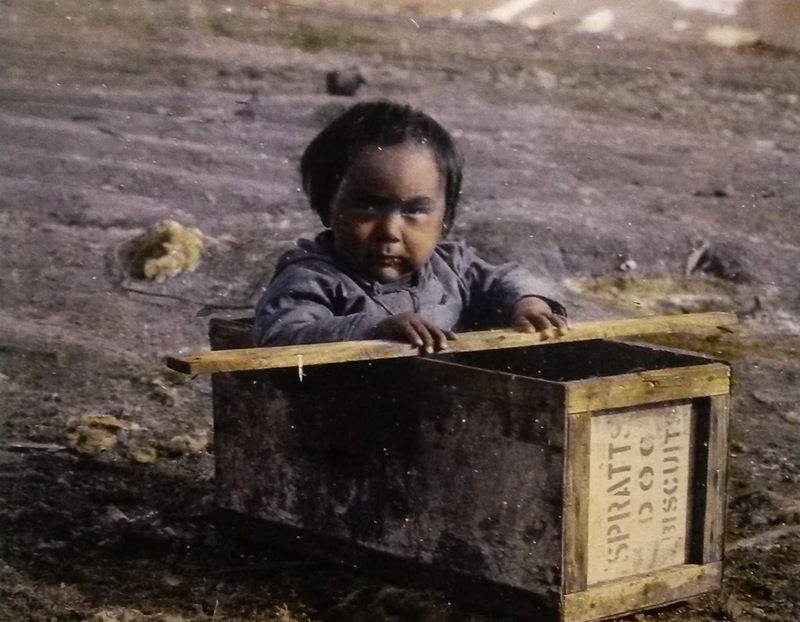 So let's look at some photos. 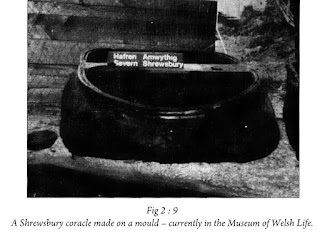 The intent isn't to identify each coracle type with a specific locale: that is the point of much of Badge's book. 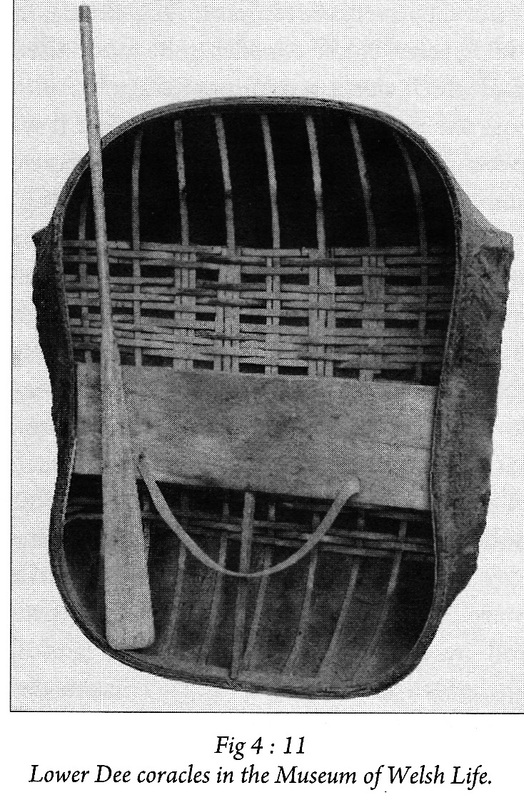 Our objective is only to illustrate the diversity, perhaps as evidence of how the creative impulse -- along with practical issues such as river configuration, available materials, and the requirements of different uses -- produced it within the seemingly simple concept of the coracle (surely among the simplest boat types in existence) in such a limited geographic range. I've left Badge's original captions in place in the images themselves; my comments appear below them. A very pleasing oval in plan view. Sides roughly straight and parallel, one end rounded, the other mostly rounded with a slight point to it. Pear-shaped. It starts out egg-shaped, then it's drawn in at the waist to attach the thwart. One end dead flat; the other rounded; sides straight and parallel. This and the previous image illustrate an odd, but fairly common, characteristic of coracles: when one end is blunter than the other, it's usually the bow. 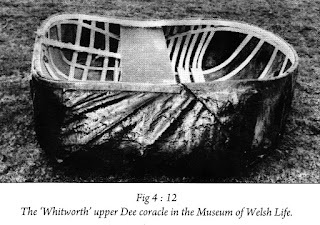 Looking now at sectional shape: some coracles have substantial tumblehome -- i.e., the bilges bulge out, and the craft narrows as it rises to the gunwales. The botttom is flat. 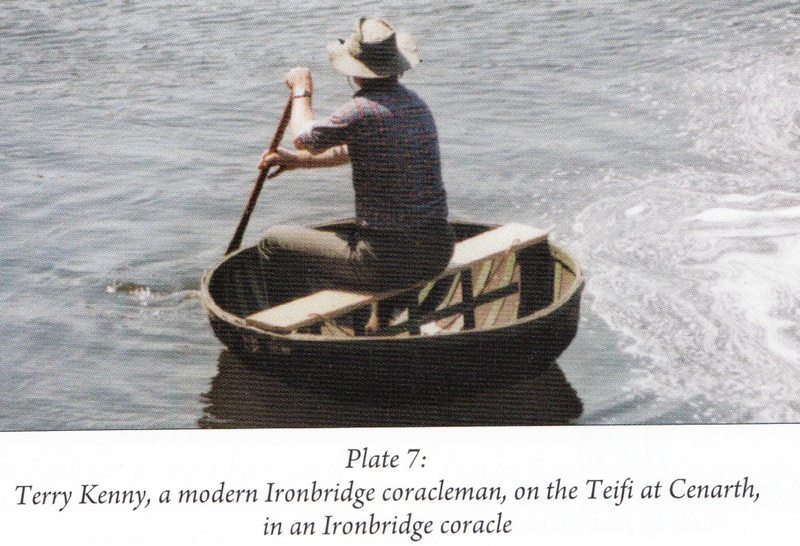 Another flat-bottomed coracle, but this one has no tumblehome. Its straight sides flare out. 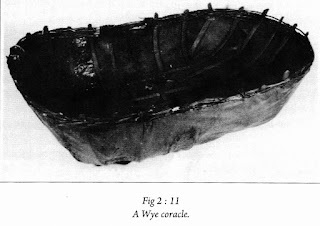 Looking now at construction methods: this coracle has a gunwale composed of woven withies and "frames" of slender branches, doubled across the bottom. The gunwale of this coracle is sawn lumber. The frames are nicely machined splints, fastened at every intersection with screws. The transverse and diagonal frames overlay the longitudinal ones. The frames are narrow, riven splints. The transverse and longitudinal frames are woven over/under/over one another. Although woven-splint construction is common, this one happens to be a particularly complex example. 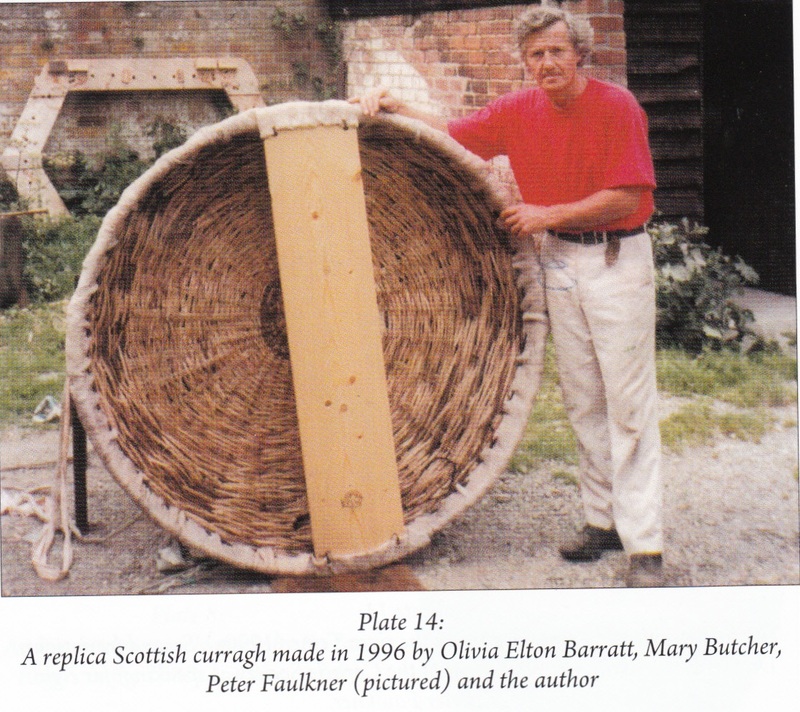 A very different construction method: the entire boat is woven like a basket. A most unusual example of splint construction. The normal right-angled orientation of splints is discarded in favor of changing angles and complex curves. 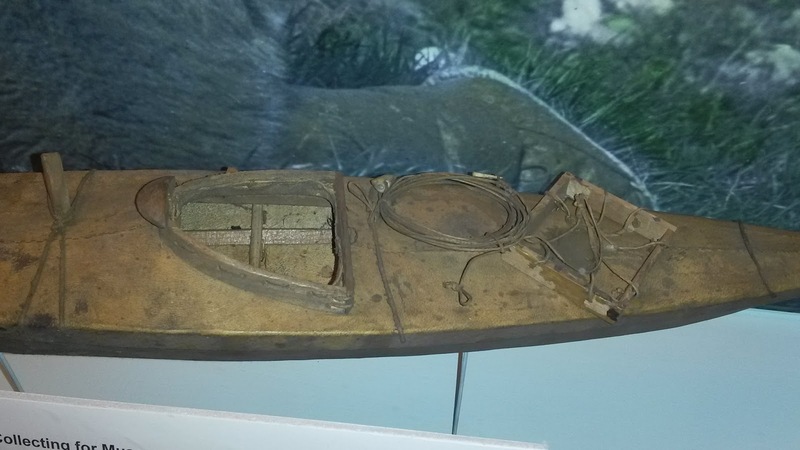 Note how a splint runs just below the gunwale around most of the boat, then curves down sharply to support the thwart. 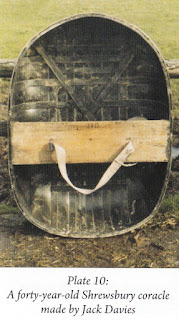 The standard method of portaging a coracle: the user places a strap that passes through holes in the thwart around the shoulders. 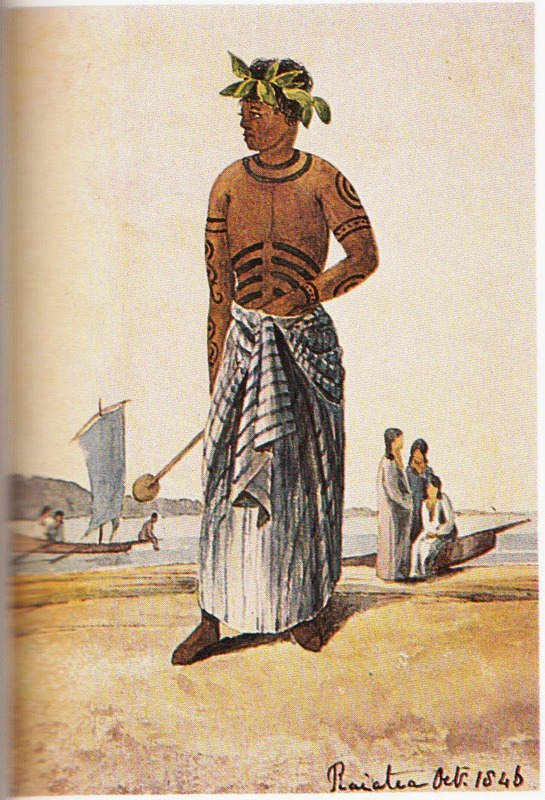 A less common method is to carry to boat inverted over one's head, with the thwart resting on one shoulder. Paddling differences: Two handed. Note also the bowl-shaped sections and the lattice-like structure supporting the thwart. The support structure also kept a sein net confined in the stern and prevented it from sneaking into the bow portion and interfering with the boater's feet. Another two-handed paddler. 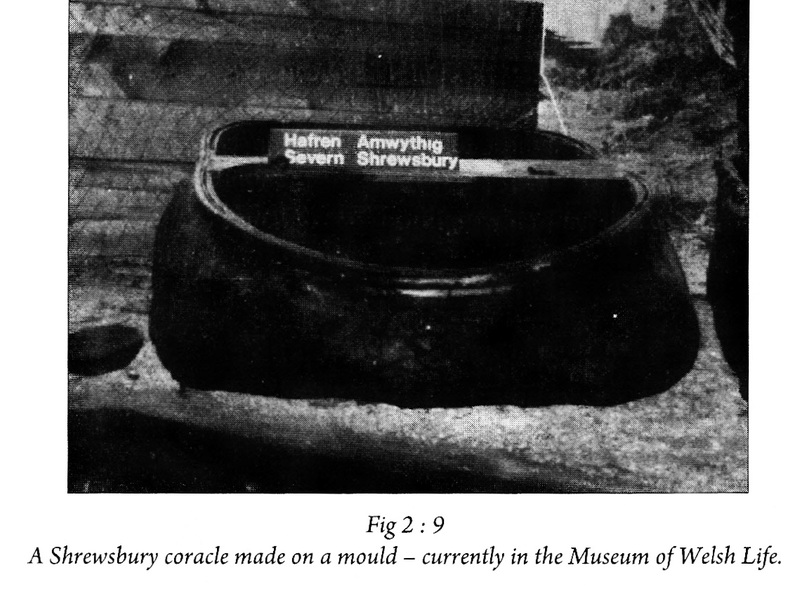 Compare the rough, irregular appearance of this coracle with the geometric purity of the previous one. 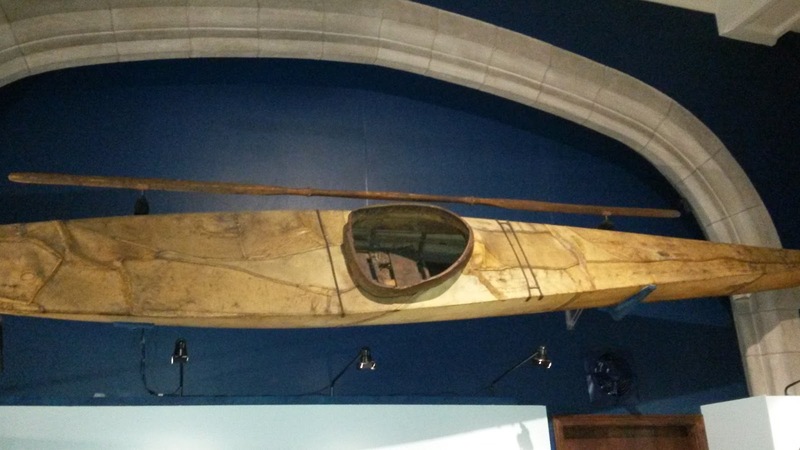 One-handed paddling was apparently more common historically. 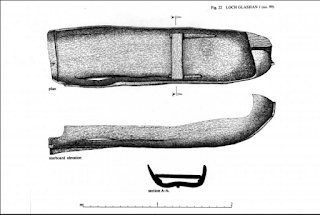 The man at right rests the upper part of the paddle's shaft in the crook of his elbow. 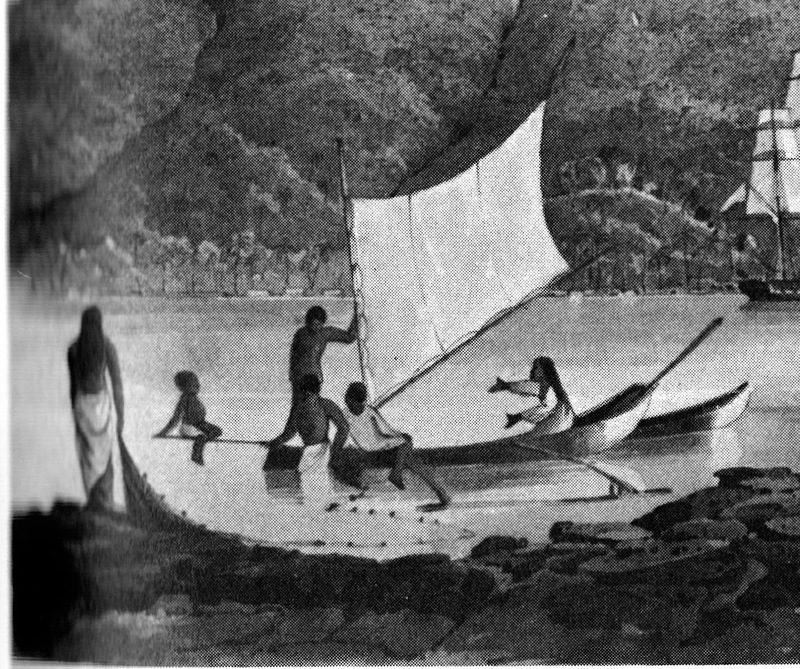 The woman appears to be sculling with the paddle grasped well below the end grip, with the loom levering against the gunwale. 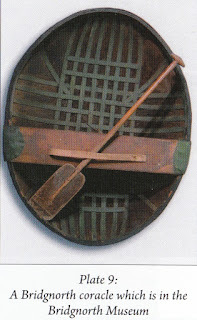 A large, two-person coracle for angling. (Note the "guide's" one-handed paddle grip. Most coracle angling was done in one-man boats, where a one-handed grip on the paddle allowed the rod to be managed with the other. But the one-handed method took hold as the norm in some coracle types, and was used even when two hands were available.) 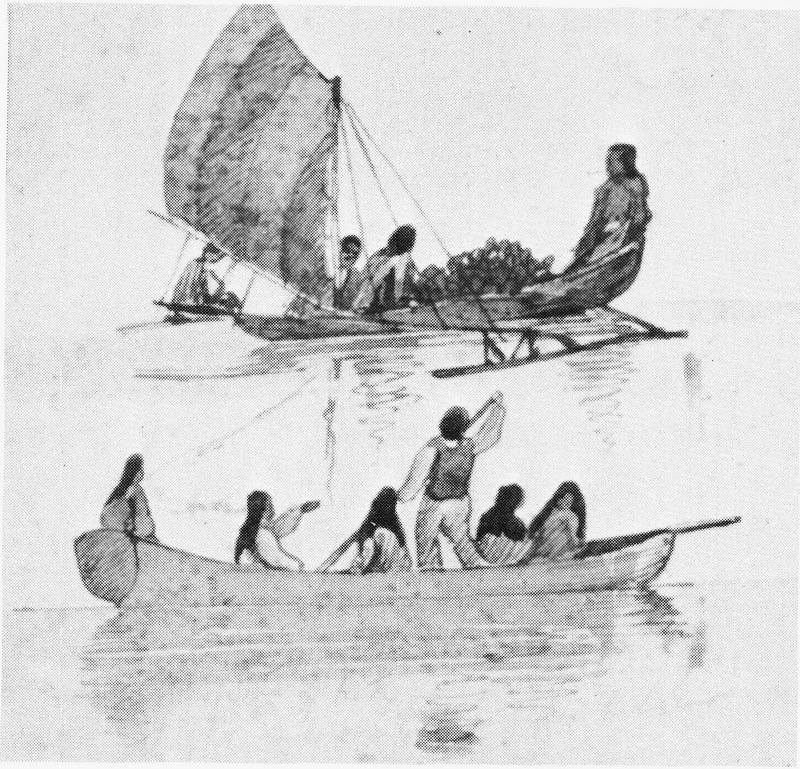 Net fishing was also done in both one- and two-man coracles. 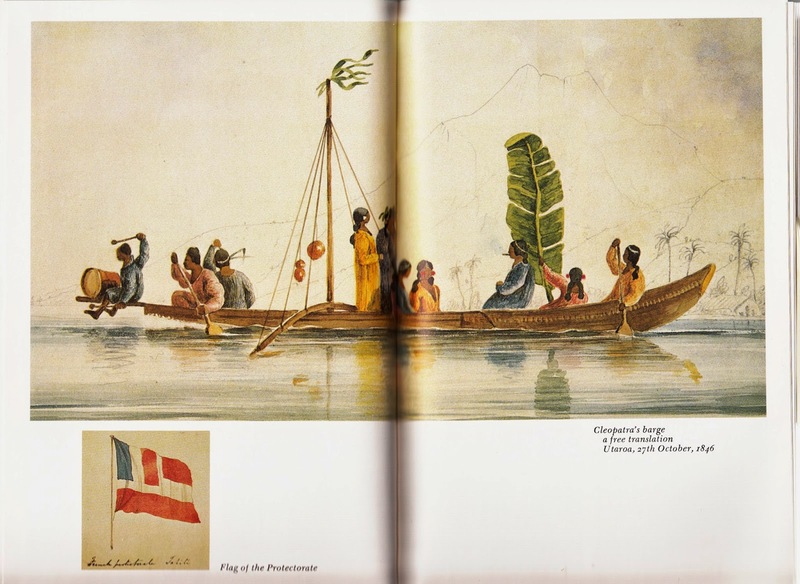 All images are from Coracles of the World by Peter Badges. The Donegal paddling curragh -- also known as the Owey Island, and Rosses paddling curragh -- is one of the odder indigenous boat survivals in western Europe. Donegal, of course, is a county in the west of Ireland. 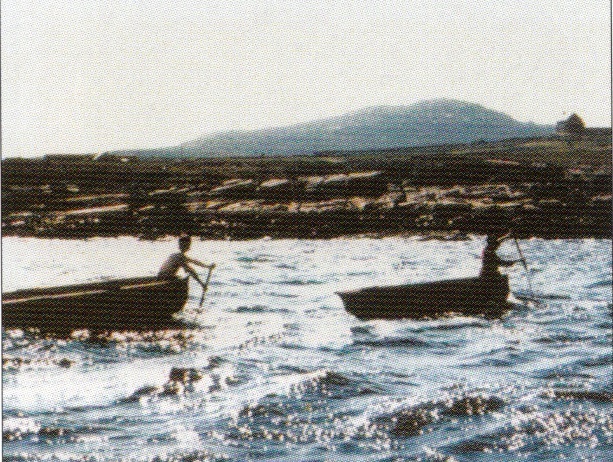 Owey Island is off its northwest coast, and The Rosses a district toward the southwest. Rossmen and Owey Islanders compete for the distinction as the originators of the type. 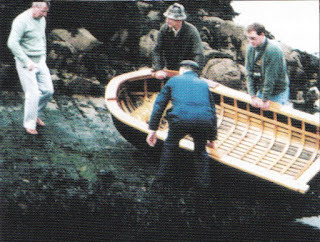 At first glimpse, the Donegal paddling curragh appears to be a tiny example of curragh, per se -- that is, a heavy type of skin-on-frame, "boat-shaped" boat formerly in common alongshore use in Ireland and popularized in modern times by Tim Severin's reproduction of one for his Brendan Voyage. 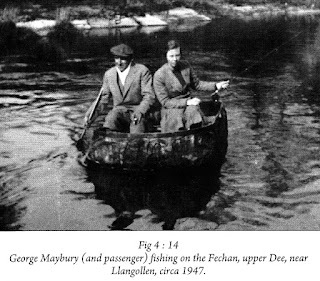 But as Peter Badge observes in Coracles of the World, the boat is only partly a curragh in the above sense, and partly a coracle. (The issue is complicated by the Irish often calling coracles currachs, as in the Boyne currach, which is clearly a coracle.) 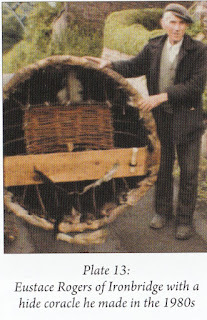 Its size -- about 8' LOA -- puts it in the realm of the coracle, as does the fact that it can be, and sometimes is, carried on the back of one man (although its size and apparent weight would make that a far more difficult task than carrying, for example, a Boyne currach or one of the coracles of the River Severn in England and Wales). 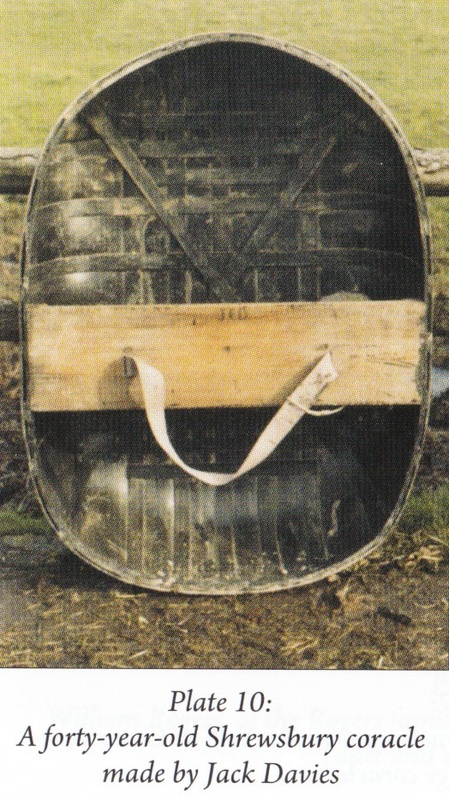 The last quality that makes it more coracle-like than curragh-like is that it is normally propelled by a single paddler kneeling in the bows with a single T-grip paddle, as shown in the image below. Paddling Donegal paddling curraghs over the bow. 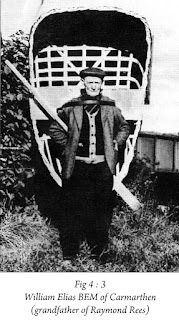 On the other hand, oars pivoting on single tholepins and a sitting thwart -- features of "true" curraghs -- were added to the design around the middle of the twentieth century, although even boats so fitted continued to be paddled as well. It is, perhaps, fruitless to argue whether the Donegal curragh is a curragh or a coracle. It bears characteristics of both: it is what it is. 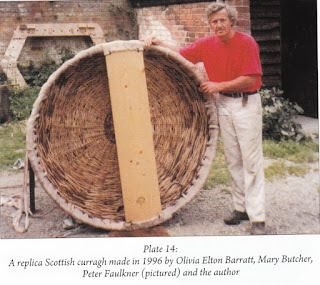 Until the nineteenth century, the framework was basket-like, made of woven withies like the Boyne currach, but by the 1930, sawn oak laths were used. In the next photo, the frames appear to be fairly heavy (one suspects they were steam-bent). 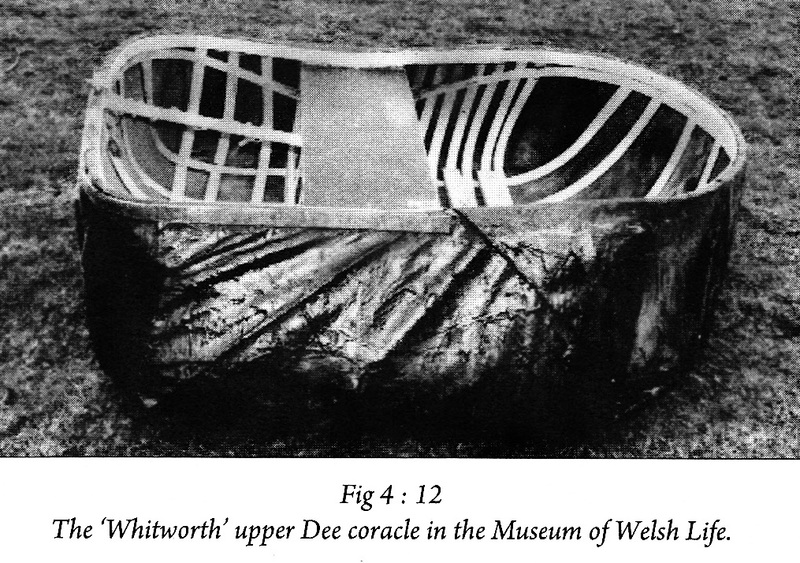 The frames are neatly mortised and wedged into the gunwales around both sides. Donegal paddling curragh, set up for rowing. Note kneeling "pad" of hay in the bow, toe brace behind the pad, sawn frames and stringers moritsed into gunwales, and pieced gunwale construction. 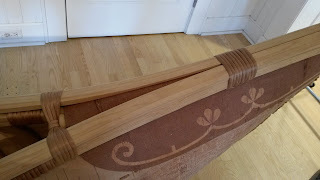 The framing of the transom is not clear from the photo, but the tops of either stringers or vertical transom frames are to be seen mortised into the member that runs across the top of the transom. 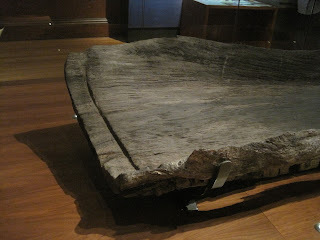 This itself is probably mortised into the gunwales, which extend a very short distance aft of that transverse member. 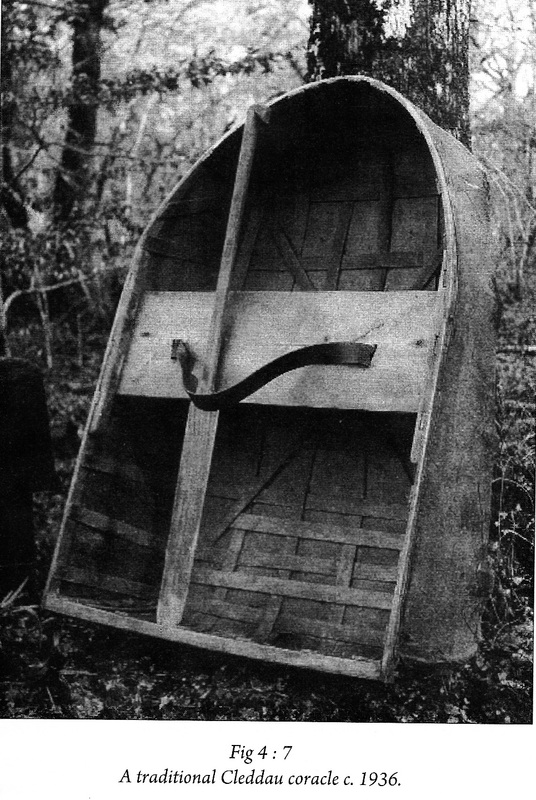 The forward structure of the gunwales is unusual. 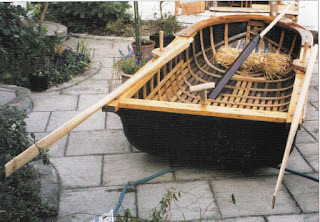 The main gunwales appear to end where the sides begin to curve inward. 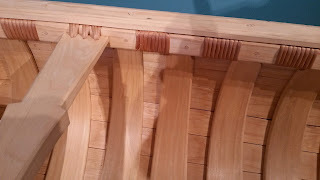 A little aft of that point, curving sections of gunwale overlap the forward ends of the straight sections and make most of the rest of the curve toward the stem. Another gunwale component overlaps the second piece on both sides, forming a kind of breasthook that ties the sides together. 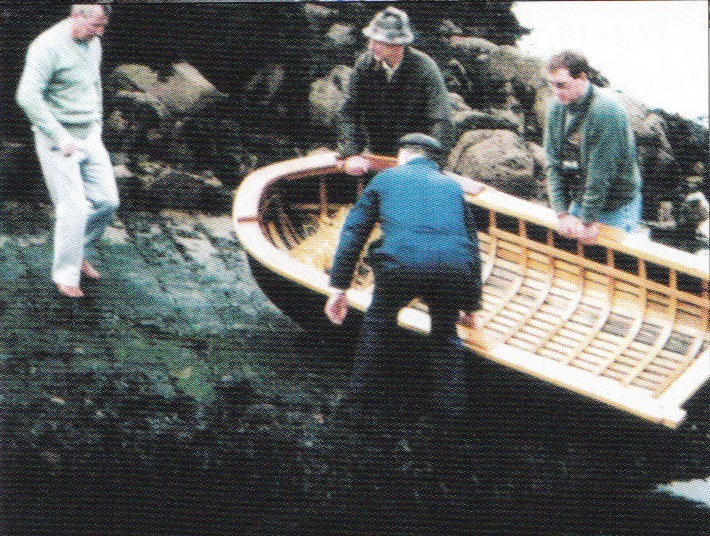 Donegal paddling curraghs were originally covered with hides, but more recently with two layers of canvas or other stout fabric, with a layer of brown paper in between, and waterproofed with tar or pitch. Quoting James Hornel, Badges gives typical dimensions as follows: LOA: 8'4" (504cm); beam: 3'7" (109cm); depth 1'8" (51cm). Whereas most coracles are inland craft, the Donegal curragh was and is used in both inland and nearshore coastal waters. 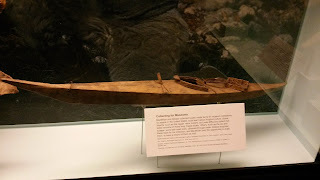 Common uses formerly included, according to Badge, "fishing (particularly for Pollock), cutting seaweed, transporting animals to and from the mainland and shopping!, but that their current use was as inland ferries and for pleasure trips." 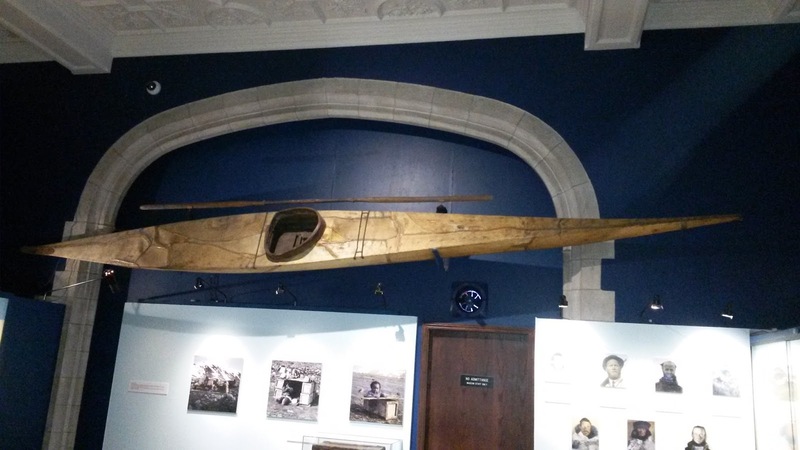 They would travel as much as two miles offshore in conditions reportedly up to Force 8, but this seems like an exaggeration for such a small, paddle-propelled boat. 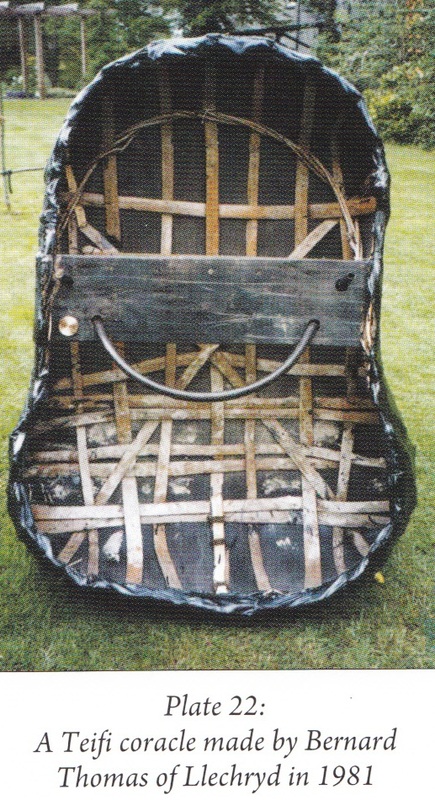 The paddler kneeled on a bundle of hay or straw, and braced his toes against a short cross-member fastened in the bottom especially for that purpose. (This can be seen in the third photo.) 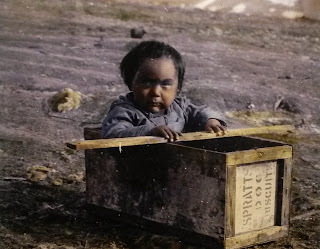 The recommended posture was a bolt-upright kneeling one -- not sitting back on one's haunches -- with the knees spread apart but with no other contact with the boat's interior. In contrast to typical coracle paddling technique, which is straight over the bow, the Donegal curragh boatman paddled over one side, then switched sides as soon as the boat began to veer in the opposite direction. Content and photos from Coracles of the World, by Peter Badge. Capt. 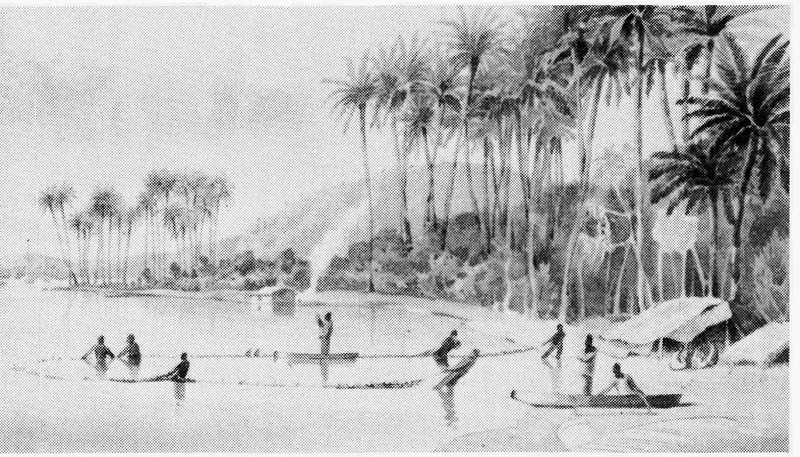 Henry Byam Martin, RN, was stationed in Tahiti in 1846-47, observing the French takeover of the island. 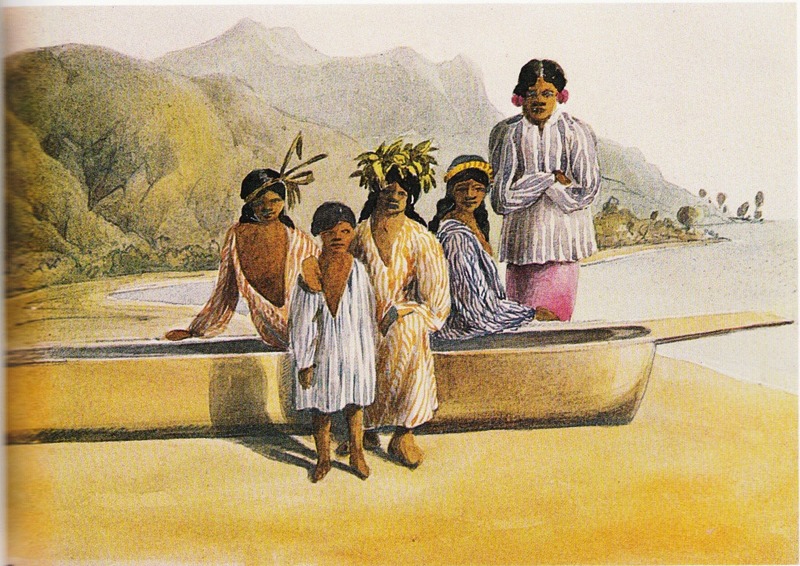 Our most recent post looked at the dugout canoes of Tahiti that he observed, while the previous one examined a large sewn double canoe from the Tuamoto Islands that he saw in Tahiti This post will focus on native stitched boats that Martin illustrated in the Society Islands, of which Tahiti is one. Stitched upper strakes, attached to (probably) a dugout base. The stitches are discontinuous. There appears to be a square transom. The long, probably flat "bowsprit" extension is in keeping with the design of Tahitian dugout canoes. Two paddlers in the bow provide propulsion, while one aft, apparently female, steers. 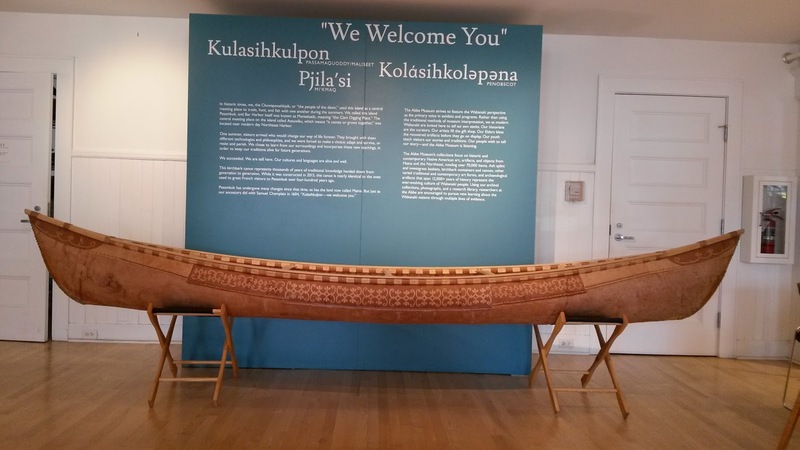 It is remarkable that there are only two power-paddlers for such a large and heavily-burdened boat, and also that they are seated on the bow's overhang, not further aft where the hull's buoyancy would provide greater support. The paddles have large, rounded blades and probably no grip at the top of the shaft. The curved, mostly-horizontal boom is a mystery, for there is no outrigger on the visible port side, and no indication of a second outrigger boom aft of it that might support the aft end of an outrigger float on the starboard side either. 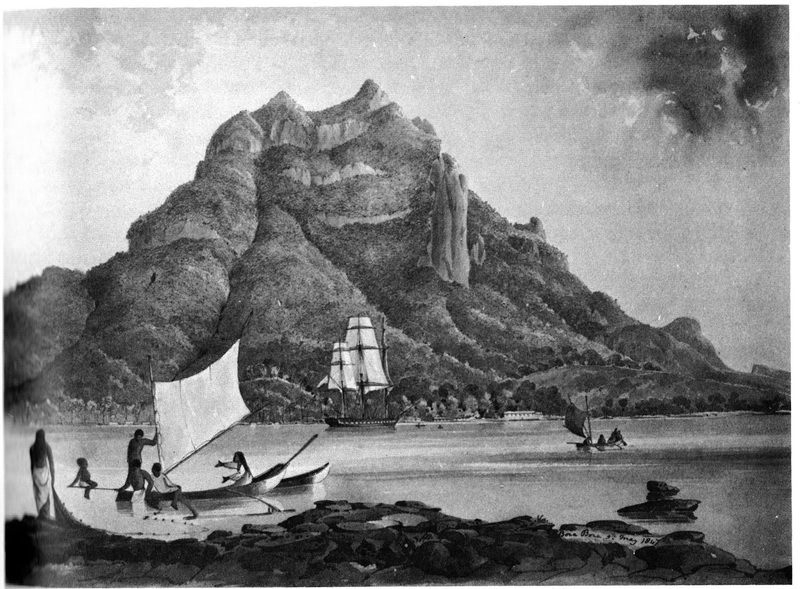 "Mr. Barff [a Christian missionary on the island] told me with reference to the ceremonies at Opoa point -- that formerly the Kings & Queens of Raiatea were inaugurated there. On those occasions the new sovereign landed from a canoe of state, which was hauled up the beach on the bodies of 6 victims -- one from each island. Hence it became a cant term to send for a roller -- which meant a mauvais sujet [lit: "bad subject," i.e., troublemaker] that the chief wished to dispose of." 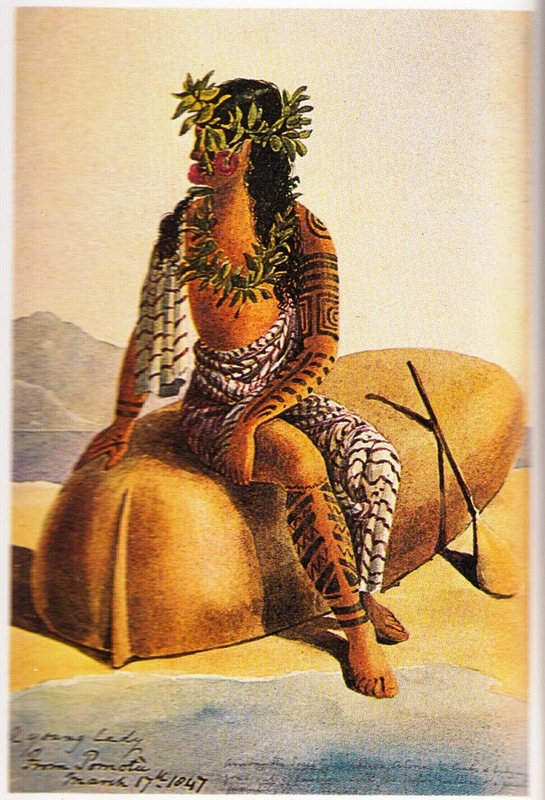 Although this sounds like a fantasy conjured by the prejudice of European cultural imperialism, many of the earliest European visitors to Tahiti -- those who visited before the onslaught of Christian missionaries -- observed and confirmed that human sacrifice was indeed practiced, and that those sacrificed for ritual purposes were typically -- and conveniently -- those very individuals who had made themselves inconvenient to the society. 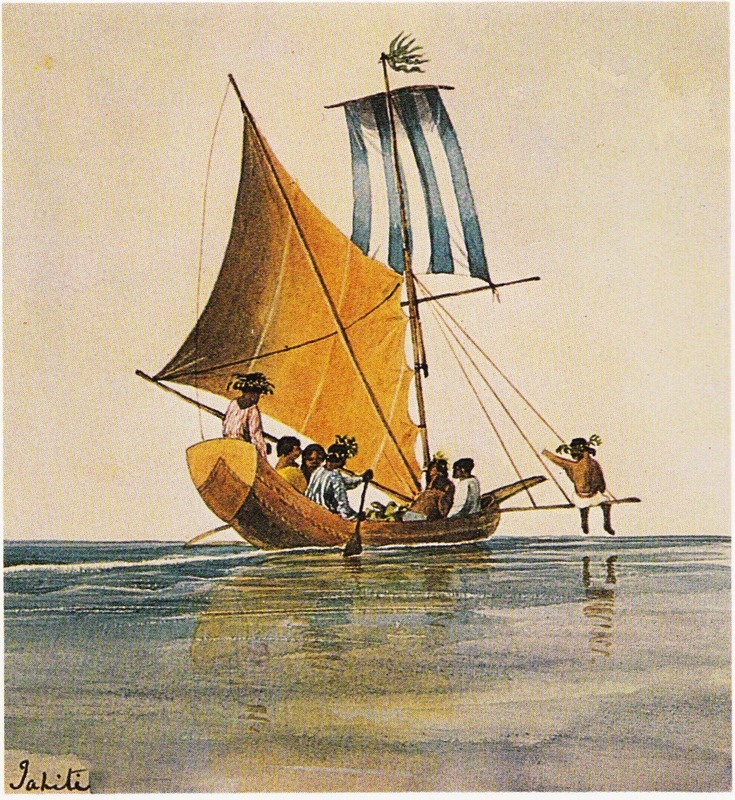 The spritsail rig is probably indigenous, but the square topsail may be an adoption of a Western type. There is a sheet to the upper end of the sprit. The topsail has both both upper and lower yards. The whole topsail rig is mounted on a topmast that is lashed to a lower mast and overlaps it by a few feet. One can just make out an outrigger boom to port. 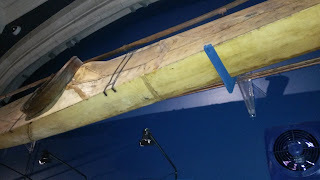 The spar sticking out to starboard serves to anchor the lower ends of three shrouds, which all meet the mast at the same point, just above the spritsail's head. 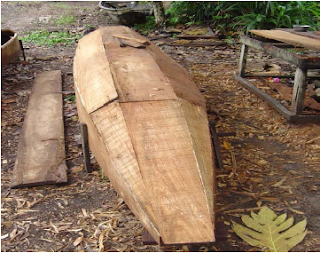 Presumably there are similar shrouds to the forward outrigger boom to port. Since there are no lines holding the starboard spar down, the man sitting on it may serve more as a mast support than as a hiking counterweight against heeling. 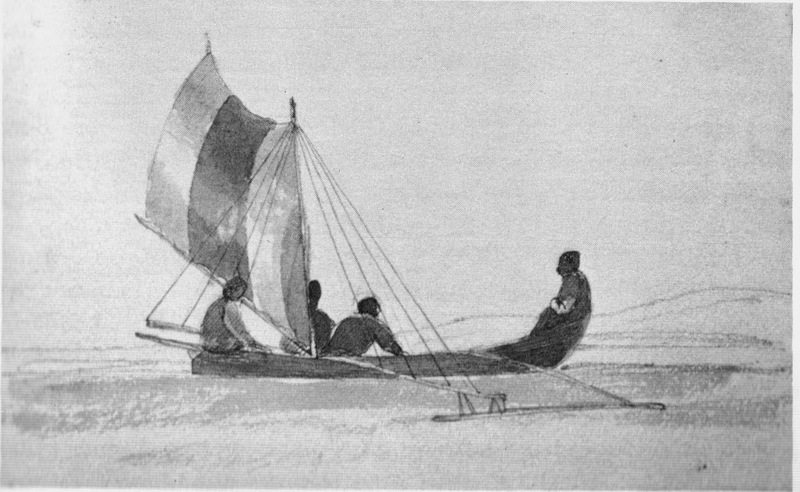 One assumes that on the opposite tack, the man would scramble to the forward outrigger boom before the helmsman allows the sails to take any pressure of wind. 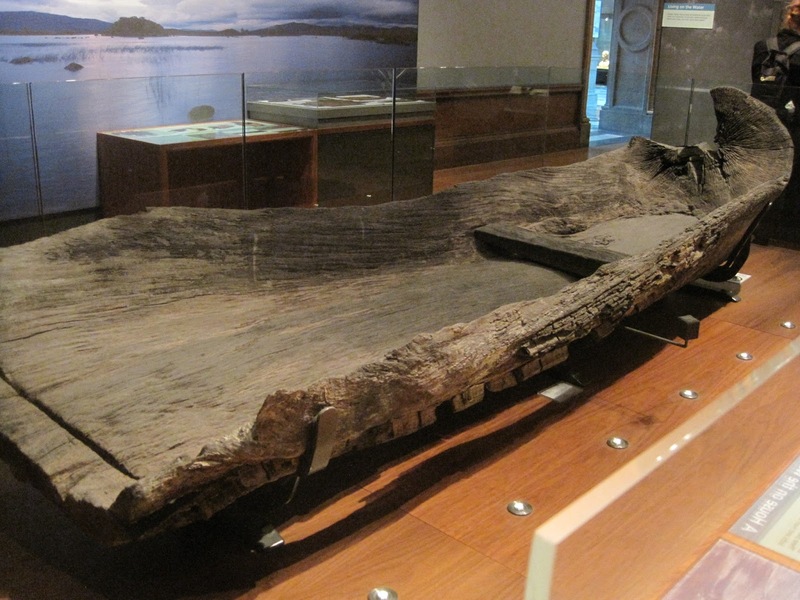 The attachment of the plank bowsprit to the uppermost strake is unclear and one wonders how it could be fastened securely with no visible supporting lines or brackets. Steering is with a single paddle held surprisingly far forward from the transom (but fairly close to the aft end of the waterline, given the long stern overhang).